Beau was born here in our home. We found a female in our backyard at the beginning of a hard Canadian winter so we kept her. She seemed lonely so we bought her a male and then along came Beau. 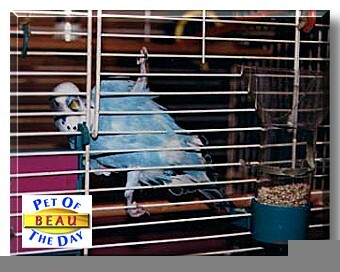 Beau's father passed on and his mother became an entertainer in senior citizen homes and elementary schools. Soon after Beau was born we noticed his legs weren't formed properly at the hips. In the photo you'll notice he's doing the splits, well, that's his natural position. He has ladders running horizontally in his cage that he slides across and hangs by one foot from and he manages to get around on the cage bars just fine. He has a great personality, he's always happy and he doesn't seem to notice he has a disability at all. He gets particularly happy when he hears water running and he loves to argue with the vacuum cleaner! Beau has a large vocabulary but he'll only speak when he thinks no one's paying attention. He's a very sweet little bird and we're very happy with him.